mài kè: wǒ zū le liàng zì xíng chē. Mike: I’ve rented a bicycle. Xiao Wang: Really? So now you can go wherever you want to. mài kè: zài běi jīng qí chē yīng gāi zhù yì shén me? Mike: What should I be careful of riding in Beijing? 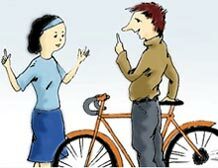 Xiao Wang: Keep on going in the special lane for bicycle, and take care of the traffic lights and pedestrians. mài kè: wǒ xiăng qí chē qù yí hé yuán. Mike: I’d like to go to the Summer Palace by bicycle. Xiao Wang: Good. But it will take you a bit long time. mài kè: cóng chéng lĭ qí dào yí hé yuán děi yòng duō cháng shí jiān? Mike: How long does it take from the urban area to the Summer Palace? xiăo wáng: dà yuē yī gè bàn xiăo shí. Xiao Wang: About one and half hours. Thousands upon thousands of bicycles in the whole country make China a “Kingdom of Bicycles”. Bicycles have become the most popular conveyance for Chinese people. Foreigners traveling in Beijing may go to some places where hired bikes are especially provided. Many of those who work in China in long period have also bought bicycles.